See this extraordinary photograph in context at the NYT. We’ll soon be seeing some travelling posts from Nigel, who’s just started his first overseas trip under the Australian Research Council grant that funds the Rugs of War project. In the meantime, here are some fascinating images we’ve found through the work of visual artist Christoph Büchel. With Giovanni Carmine, Büchel exhibited an installation titled “PSYOP – Capture their minds and their hearts and souls will follow” at the Sharjah Biennial 7 held in the United Arab Emirates from April – June 2005. Opening on May 23 at Reg Vardy Gallery will be a faithful recreation of the Sunderland hotel room Mr. Büchel stayed in during his preparations for the exhibition. 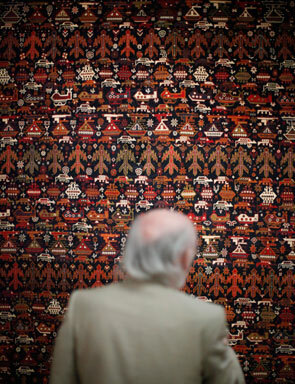 Displayed in this room as if by a traveling salesman are imported hand-woven rugs from Afghanistan commemorating the events of September 11, 2001. 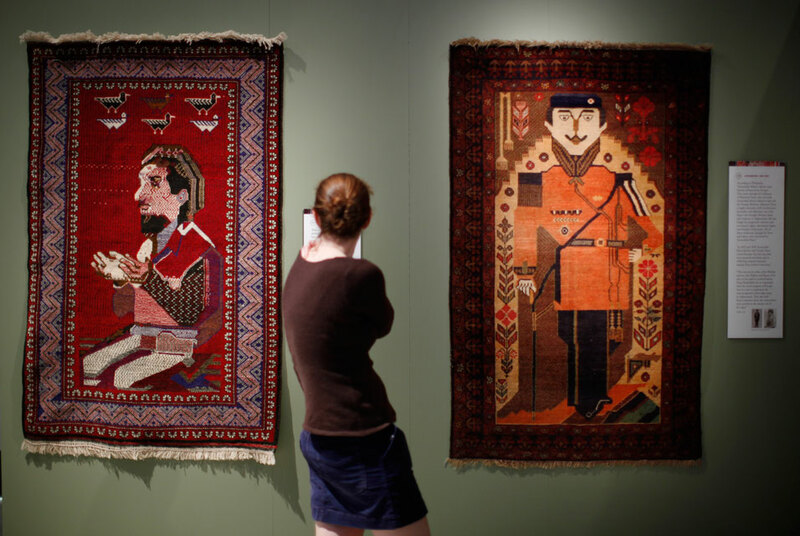 The woven imagery appropriated into these rugs is derived from leaflets dropped on Afghanistan as part of the coalition forces’ psychological operations of Operation Enduring Freedom. Mr Büchel is represented by Hauser & Wirth, whose London gallery will show a major exhibition of his work later this year. We thank him for his kind permission to reproduce these images here. The purpose of the PANDORA Archive is to collect and provide long-term access to selected online publications and web sites that are about Australia, are by an Australian author on a subject of social, political, cultural, religious, scientific or economic significance and relevance to Australia, or are by an Australian author of recognised authority and make a contribution to international knowledge. PANDORA also has a search function. We have updated our comment policy and information on how to contribute to reflect that contributions and comments will be permanently archived.